Groovy Ale is modeled after the Dusseldorf-style Alt Bier which is Germany’s equivalent to the ales of England. 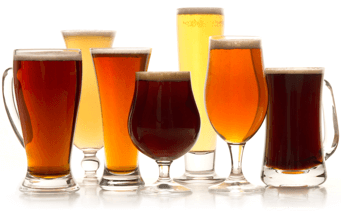 The German word Alt means old or ancient and refers to the fact that these beers are brewed by the traditional method of top fermentation predating the relatively new method of bottom fermentation now predominant throughout Germany. Alt Biers are generally found in Dusseldorf and served in short stubby glasses. As one is finished the waiters of this area will automatically replace it. The only way to stop is to place a coaster over the empty beer glass! Groovy Ale is brewed with a combination of two-row Pale, Caramel and Black Patent malts. The majority of hops used are Cascade, which are added both at 15 min. and again at 60 min. into the 75 min. boil for both bittering and aroma. Fuggles are also used up front for additional bittering, while Tettnanger hops are later in the boil for their aromatic and flavor contributions. Complementary Foods for the style include: Baked Brie Cheese and bread, and various luncheon meat sandwiches. Appropriately light brown in color, we found Groovy ale to be a highly hopped, medium-bodied beer with a big malty flavor profile. Look for some hop fruitiness and sweet maltiness in the beer’s nose and a very clean, crisp and flavorful body. Note that fruity esters are low to style and Groovy Ale finishes somewhat dry with a slight roasted character evident. Overall, an excellent interpretation of an unusual style not brewed by too many micros. 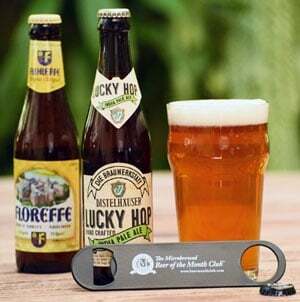 Founded in 1988 by Tony Nguyen, The intent of the American Beer Guy Brewing Co. was and continues to be to produce fun products that compete with the highest quality U.S. micros. Tony business roots stem from a Manufacturing-management background as he has held both technical and managerial positions at Rolm (Siemens) and Megatest, and has extensive hands-on experience in the food & beverage industry. Tony has developed recipes for three other beer styles in addition to the Alt Bier featured this month, however, Groovy Ale is the only product currently in limited distribution. For more information about the brewery and scheduled tours, call (415) 332-7421 or check out their web site at www.beerguy.com.